At the fitness center located on the 20th floor, an exclusive space is available for guests to exercise and relax. 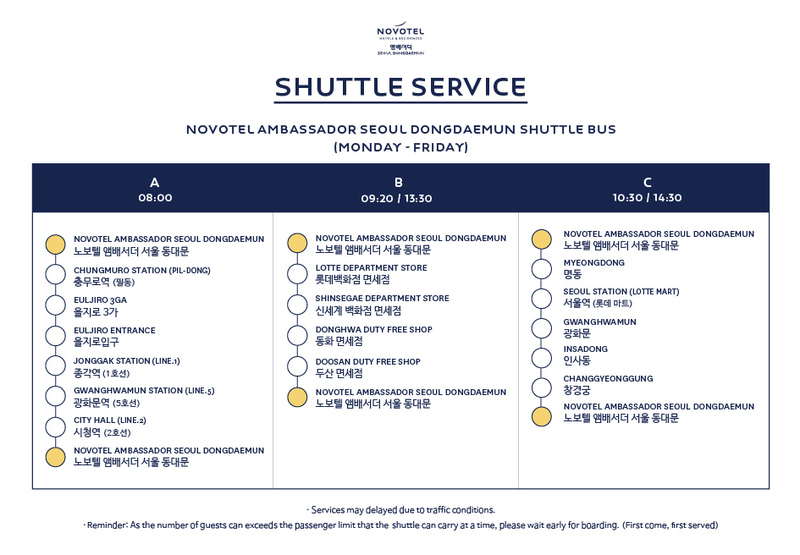 The Novotel Ambassador Seoul Dongdaemun operates an indoor and outdoor swimming pool. The executive lounge located on the 19th floor is a lounge made exclusively for guests staying in rooms on the executive floor and in the suite. Located on the 19th floor, business center is a convenient office space optimized for business. Under the concept of Family & Novotel, and for the convenience of guest families with children, a Kids' Room has been created with different play facilities and stocked with printed material. A nursing room was set up on the 1st floor basement for guests traveling with infants. The prayer room for Muslims includes worship mats, koran, compass, and washing facility to pray for Mecca without any discomfort during your stay. The roof top garden on the top floor of the hotel features an outdoor swimming pool and a yoga zone for a variety of activities. The outdoor swimming pool is open seasonally, and the yoga zone is limited in operation depending on weather conditions.